Posted on October 5, 2010 by ginny | Comments Off on Ask and you shall receive! — What is a Marian apparition? — When Joseph decided to “divorce Mary quietly,” why didn’t she get mad? — What does the Council of Ephesus have to do with Mary? Click on the links to get the answers! And if you have a question about the Blessed Mother, submit it to the BustedHalo Question Box! I’ll answer any Mary question, even if you feel stupid asking it (and remember what your elementary school teachers always said: There is no such thing as a stupid question.) And if you have questions about other areas of faith (Catholic tradition, history, ethics, etc. ), you can submit those, too. I won’t tackle those, but other writers will. 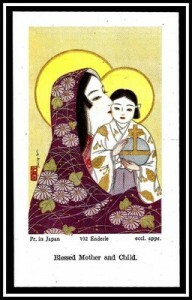 And just to brighten your day, here’s a lovely picture of the Madonna and Child. I don’t know about you, but I always find that a great moodlifter.